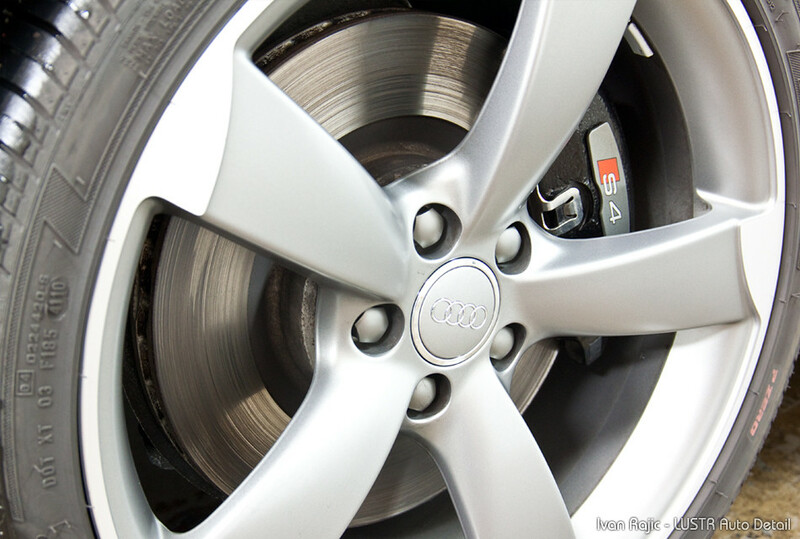 Many of us have wondered in the past how to keep that rusty look off brake rotors after a wash. I hate the look on my own car and I’d hate even more to give a client a freshly detailed vehicle with rusty looking rotors. 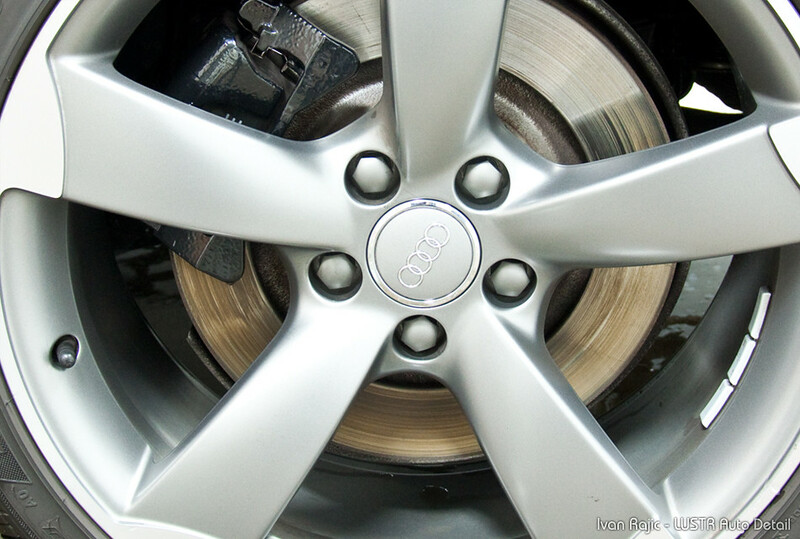 Because we move the car around a few times between washing and handing it over to a customer, the rusty look on brake rotors goes away pretty much completely. However, there are usually still some remnants of it that could use a wipe down in order to leave a really nice finish on the rotor. 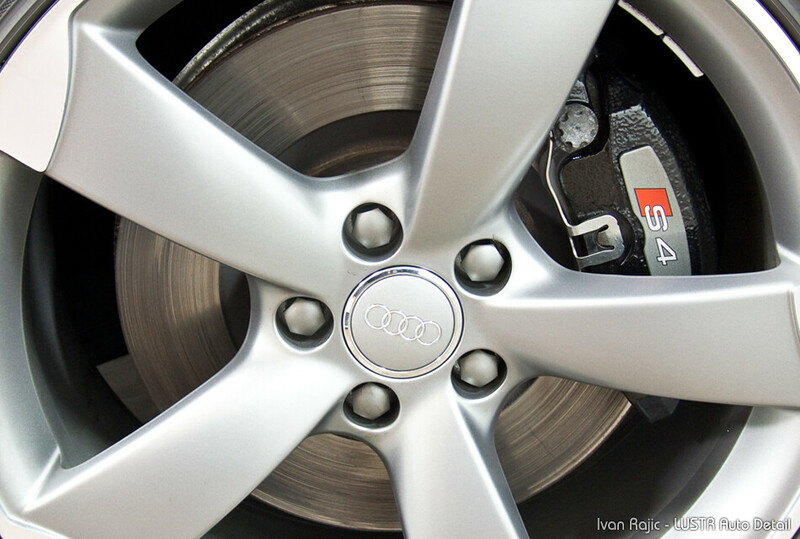 Similarly to dressing the tires and trim, clean rust-free rotors give a detail job that extra contrast and much better look overall. With that, it would be a good idea to have a product on hand that could eliminate the need for wiping the rotor or leaving it as is for the client. This is where Rustopper comes in. Hyde’s Serum Rustopper is an acid-free and pH-balanced product that’s safe for all wheel finishes and handles the above mentioned task very well and efficiently. I received Rustopper a few weeks back to really put it to the test and see how it performs its duties. In short, I’m impressed and will be using it on every detail job going forward. It’s a great solution for the rusty rotor and I like it even more because it’s quick and efficient. 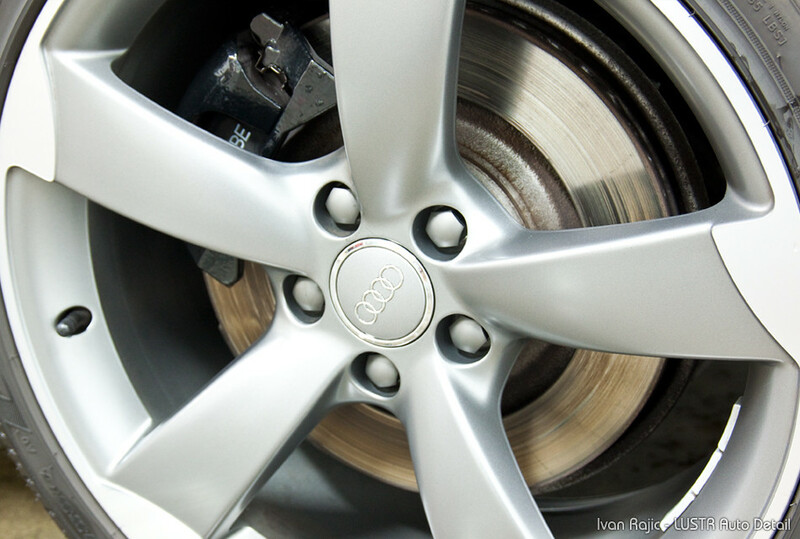 Have you ever cleaned your wheels, only to be disappointed with rusty brake rotors? Well, the Hyde’s Serum Rustopper is your answer to this ugly mess! Rustopper will help clean your rotors and pads, removing some some of your existing rust while coating your rotors and pads in a protective film that helps prevent any future rust from occurring. 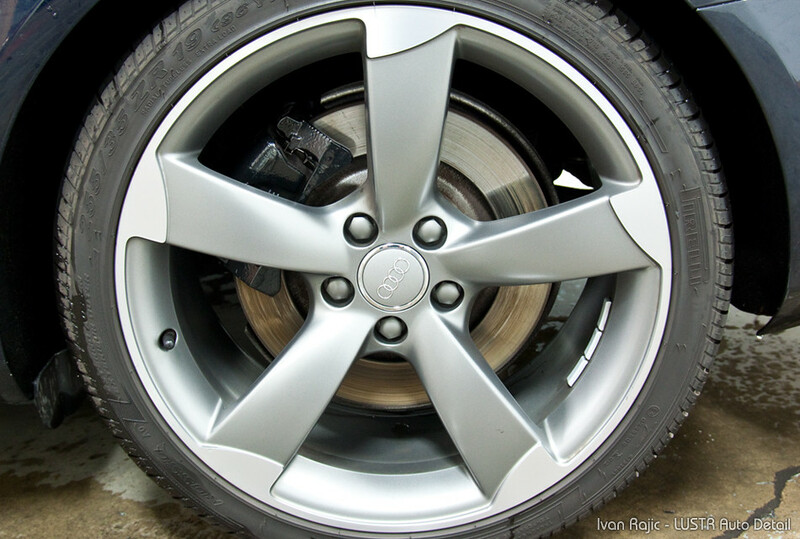 Upon completion your wheels will look significantly better and be protected against rusting as well. 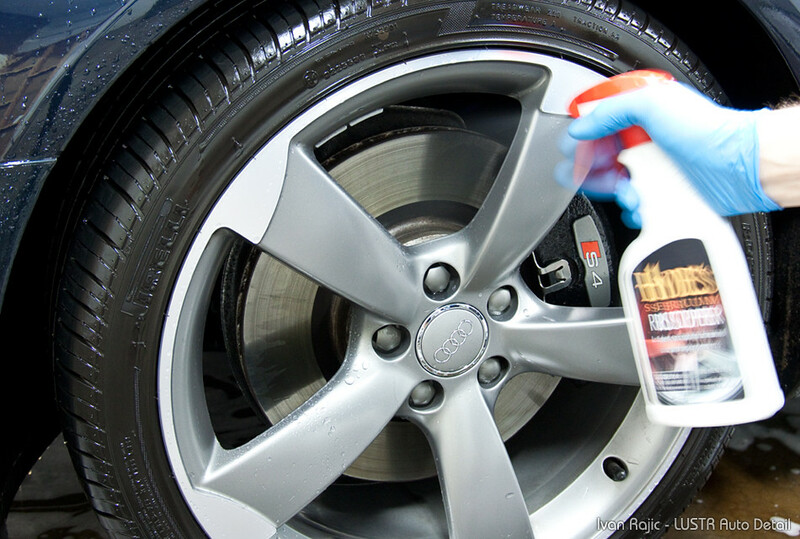 To use this product you’ll want to first thoroughly clean your wheels and rotors. Simply spray on your favorite wheel cleaner, we recommend the Sonax Wheel Cleaner Full Effect, and clean with favorite wheel brush (i.e. EZ Detail Brush, Wheel Woolies, etc.). 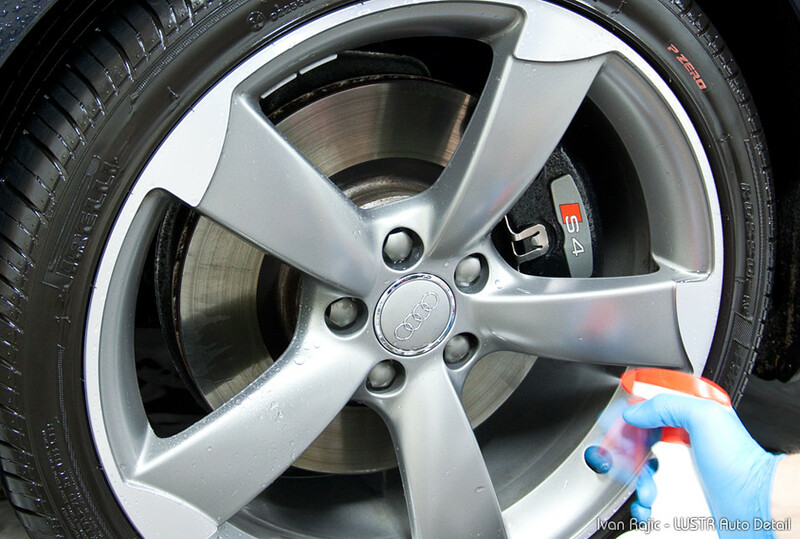 Rinse your wheels clean and before they dry, spray on a liberal amount of Rustopper to the rotors. Allow the Rustopper to dry, wipe away any excess water and cleaner on the wheels and walk away, it is that easy! You will be amazed with what you are left with, a clean looking rotor without that ugly orange rust. 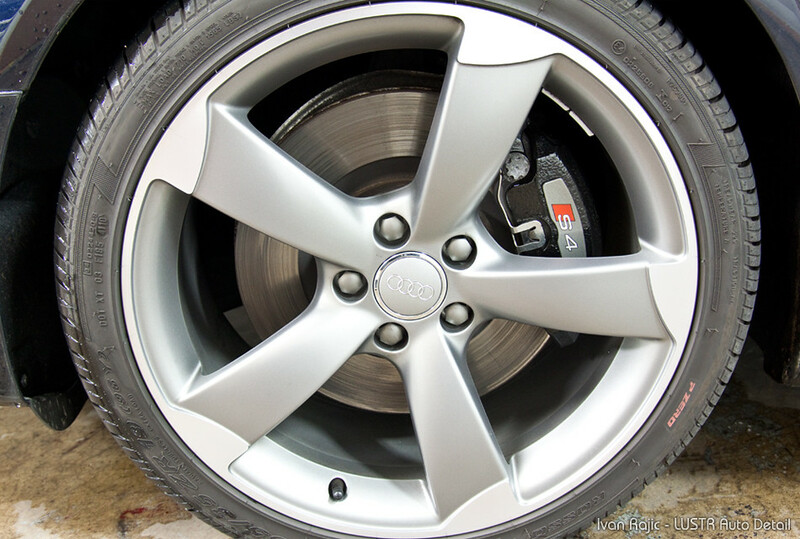 Not only is this extremely helpful in boosting the appearance of your wheels but it also helps prevent ugly orange brake dust from hurting the surface of your wheels as well. Rustopper is acid-free and pH-balanced, meaning that it will not harm brake your components and it is safe for all wheel finishes (i.e. steel, alloy, chrome, polishes, anodized, single stage paints, etc.). 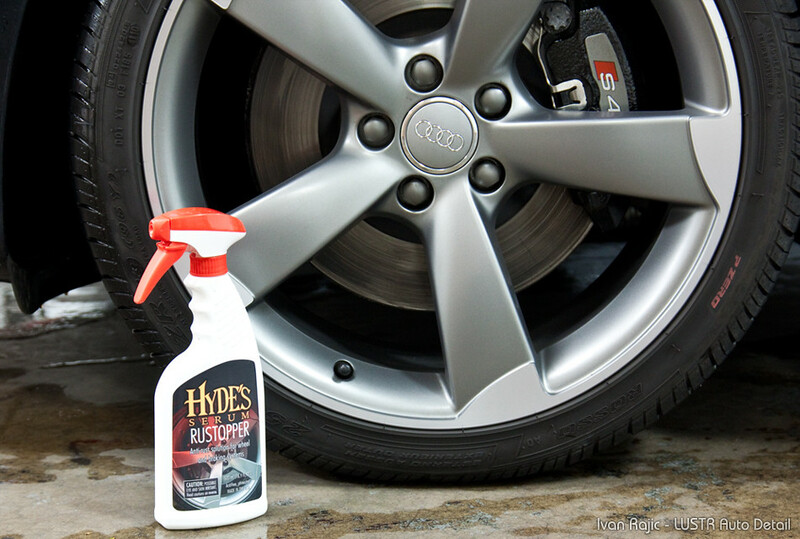 Keep your brake rotors looking their best with the easy to use Hyde’s Serum Rustopper! 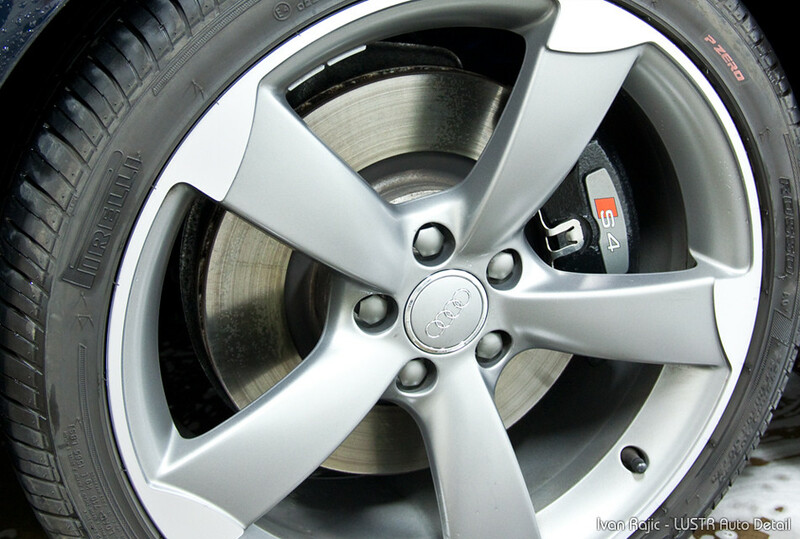 As the description states, Rustopper was designed to keep the rotors free of the dust that forms and gives them that rusty look. It works simply by coating the rotor after washing and then wiping off any excess once it dries a bit. As simple as the instructions are, I wanted to do a quick how-to with corresponding photos so it’s even easier to understand. 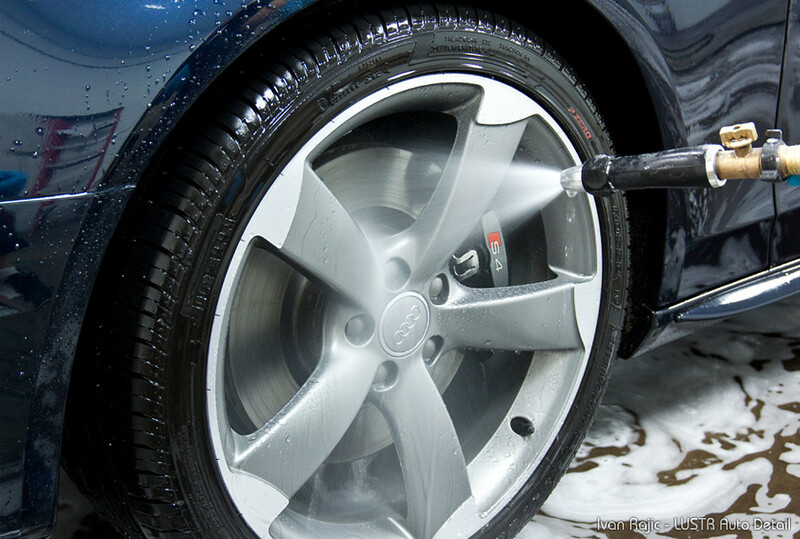 First off, you’ll want to clean the wheels as usual with brushes, cleaners, mitts, etc. I list the products I use a lot in my Wheel Cleaning Supplies article. Once clean, simply rinse off all the soap/cleaner and let it sit for a minute so a good amount of water drips off. Before it fully dries, liberally spray Rustopper to the rotor, ensuring the entire rotor surface is completely covered. Once done spraying, you can let it sit a bit while it dries, then wipe off any excess with a towel. I normally like to spray Rustopper on all four wheels, then go around with the Metrovac Blaster quickly to dry the wheels before wiping off excess from the rotors. Well, it’s that simple. Below I took some photos of a rear wheel that didn’t get Rustopper and a front wheel that did. As mentioned above, we always use the Metrovac to blow as much water as possible out of all wheel surfaces, so in the photos below there is only minor rust on the untreated rotors. Normally, if you don’t blow off the water immediately or you only quickly dry the rotor, the rusty look will be much more pronounced. Regardless, you can easily tell the difference between the two rotors below, so let’s take a look at the photos. The first photo in the pairs below will be without Rustopper and the second photo with it. As you can see, Rustopper made a huge difference in the overall look of these rotors. What I didn’t mention is that in the photos here, we never wiped down the excess after spraying on the rotors. We simply applied a light layer of it on each rotor (about 4-5 sprays only, enough to cover the entire rotor) and then let it dry for a couple minutes. After, we went with the blower and dried it completely. The more time you spend on the application (the more product the better, but don’t go overboard) and when you wipe it down properly after drying, the better results and even look you will get. In these photos I wanted to show that a very simple and quick application of it without any wiping will make enough of a difference to prevent the rusty look from showing. As you can imagine, I would highly recommend Hyde’s Serum Rustopper for any professional and enthusiast detailer. It’s a great product that works well, works quickly and gives better results! That is a great idea. I get that quite often so I will be ordering some soon. Thanks. Ivan, thank you for such an amazing review and for explaining how Rustopper works so people feel comfortable using a new product to get rid of the rusty rotors and rust dust on clean wheels. The photo comparisons are great and show the drastic difference between using Rustopper or not.